Is the zucchini in your garden growing like crazy yet?! I am always looking for ways to use some of it up and what is better than being able to sneak some into your desserts. Brownies happen to be my favorite dessert and I couldn’t wait to try out a recipe with zucchini in it. This recipe is absolutely wonderful. This zucchini brownie recipe is a delicious way to use up some of that zucchini. They are soft, rich and SO yummy! Combine oil, sugar, vanilla together in a large bowl and mix until well combined. Add egg and beat in until well blended. Add flour, cocoa powder, baking soda and salt and stir until well combined. Stir in zucchini. Batter will be on the drier side. Don't panic, the moisture from the zucchini will come out while baking and moisten it up perfectly. Pour and spread out evenly in prepared pan. Bake at 350 degrees F for 25-30 minutes until done. Melt together butter, milk and cocoa in a medium microwave safe bowl for 1-2 minutes until butter is melted and mixture is warm. Stir together. Add powdered sugar and vanilla and mix until smooth. Spread over cooled brownies. I love baking with zucchini and between your cookies the other day and now these, you have given me some awesome ideas! Love them both! I've made brownies with avocado to replace some of the butter but am loving this zucchini idea! Pinned! I really want to try these. I have tons of zucchini. We are a bit done with zucchini bread. Up next, brownies! No, you don't cook the zucchini beforehand. I find the best way to "hide" it is to peel it (the green is a dead giveaway) and grate it finely. Tasty, but it is more of a cake, does not have the dense fudge texture of a brownie. Nikki are you squeezing the moisture out of the zucchini or shredding it and using it as is? Shredding and using it as is. 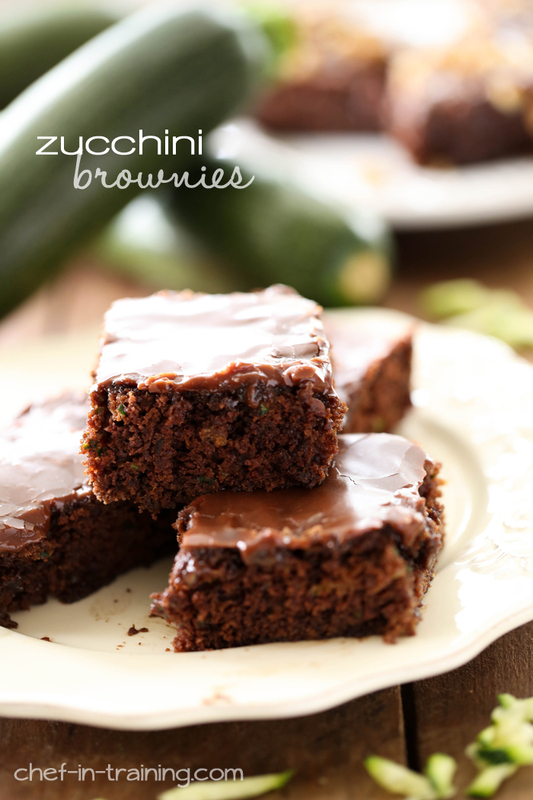 The moisture from the zucchini will come out while baking and helps to moisten up the brownies perfectly. The batter will still seem on the dry side when you first add it, but they cook up nicely! I've done it with half applesauce and half oil, and it came out fine! Just be sure to use unsweetened applesauce- we used our homemade stuff. Go ahead and use the applesauce if you want to! Looking very forward to trying these. I've got a giant zucchini in the fridge to use. Thanks for posting. So, is this recipe with or without the addition of the egg? I mean....do I need to ADD another egg? I am zucchini rich at the moment! Thanks! Hi, do you have to squeeze the juice out of a zucchini before putting it in the batter? I grated the zucchini on the smaller grater side of the box grater and added and mixed it in before adding the flour. I stirred the flour minimally and let the bowl sit for a couple minutes after mixed so the gluten didn't develop, but the brownies were super fluffy. It was like eating cake or a chocolate cake donut. I only cooked them for 20 minutes. The frosting and the brownie we darker than I like; I prefer milk chocolate, but I'm sure using a different cocoa powder would fix that. We could not taste or feel the finely shredded zucchini. These were good for a cake, but we'll stick to our other brownie recipe if we want good, fudgy brownies. I have a recipe very very similar to this...it is so so yummy...I encourage everyone to make it. I love desserts that have sneaky veggies!! The kids think they're getting something a bit naughty when they're really getting their daily greens! I really wanted to love these. But it was more cakelike than brownie as the above poster mentioned. Recipe needs a little more tweaking to be a brownie I think. Good idea though. I'm feeling pretty silly about this but...the cocoa and the cocoa powder listed are two totally different items correct, not just a typo or oversight? Making solute that it isn't all supposed to be cocoa powder. Thanks a bundle! I fixed this EXACTLY as instructed and it turned out DELICIOUS!! Very moist! No need to add extra egg or anything. Do just as described. I love this recipe, so thank you for sharing it. I had 3 cups of zucchini from one so I ended up making the cookies too. My first thought was they were kind of cake like and not fudge like another poster mentioned, but i brought them in to work and they are so moist today that they are more of a brownie than a cake. This was my first recipe from your site and my second with the cookies....I think my waistline (and my co-workers) is in trouble,but I'm looking forward to reading more of your recipes. Thanks again. I don't have any zucchini in the garden but I have half a ton of yellow crookneck and pattypan (Bening's Green Tint) squash. So - here goes. I hope to report back soon. Wow! Bravo the best recipe ever! I add 2 tbsp of water and they are very moist! Love them! I'm making only this recipe now! Bravo! Do you have an idea on the nutritiional info for these brownies? I made them and LOVE them so much! MMMM! I tried to make your zucchini brownies and when I followed the recipe the mixture was very dry. Could some ingredients have been left out? I ended up adding more butter and some milk to make the batter moister. the batter is actually a really dry batter. Almost startling dry compared to other brownie recipes, but as the zucchini cooks, moisture is leaked out and they end up perfect! This is awesome! It's a cake though, or at least that's how we're using it! I tried it with the recipe frosting which is good but too much chocolate for me so I tried it again with store bought white frosting and it was great! Taste just like Devil's food chocolate cake. People are amazed when I tell them it's zucchini cake! Just amazing! but i added some water coz only one egg with the sugar and then flour was hard to stir, but it's faboulous at least i don't feel guilty! thank you a lot! They look awesome!may be one of my favorite recipes! Forgot to rate this yummy delight! Best brownie recipe yet! This brownie is fabulous I have yet to be disappointed. My family and friends love it ?